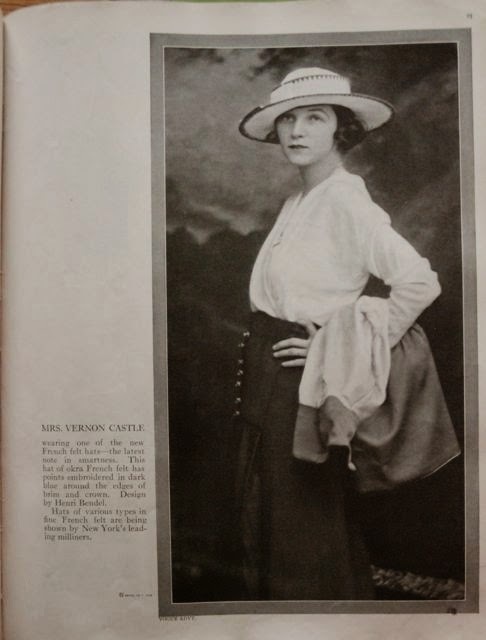 This is another nice little thing in vintage magazines and I don't think I've shown it to you before. 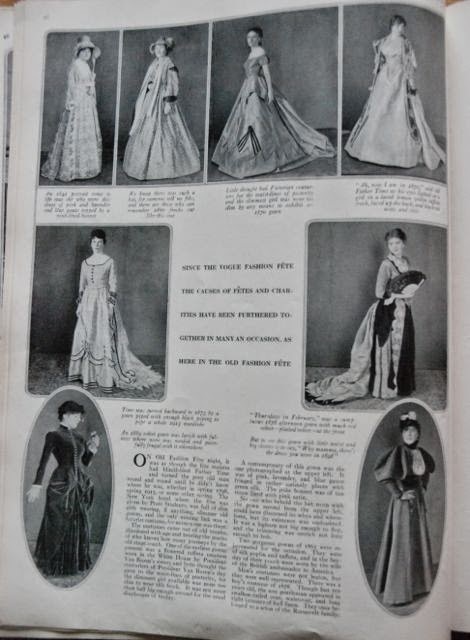 Magazines like Libelle (from which these pictures come) wouldn't just offer normal sewing patterns for their readers to order. Oh no. About twice a year, they came up with something really special: a genuine haute couture pattern. Usually from Paris. 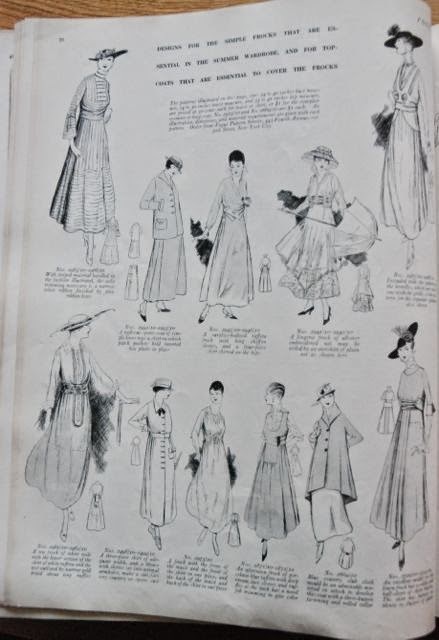 They obtained these patterns under the then normal licensing system (the same system which gave RTW manufacturers the opportunity to legally reproduce couture designs). This meant they would buy a toile and the right to reproduce the design. They would then have to put the pattern on paper, grade it (usually in three sizes) and provide sewing instructions themselves. 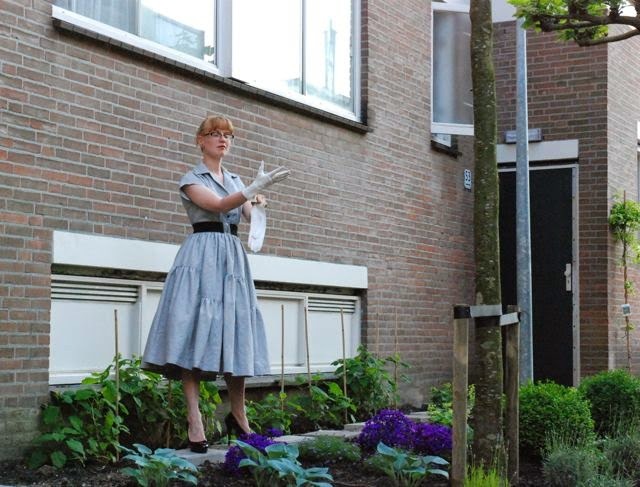 Obviously, Libelle would pick designs which could be sewn and worn by the average Dutch woman. And maybe there was a cost issue as well, because these patterns are never for garments by the best known designers of the time. Here, in September 1960, they are showing this design by Jacques Esterel (a name I've never heard or read before). It's a real early 60's design in its shape and it has an interesting asymmetrical effect. A visit to the salons of Jacques Esterel means taking place in a whirlwind of experiences. 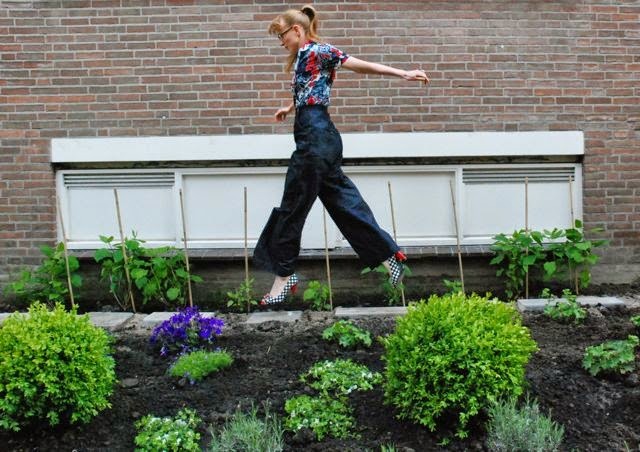 Because ever since this engineer is literally and figuratively in fashion, the quiet, chic and conventional French fashion world goes from one sensation to the other. 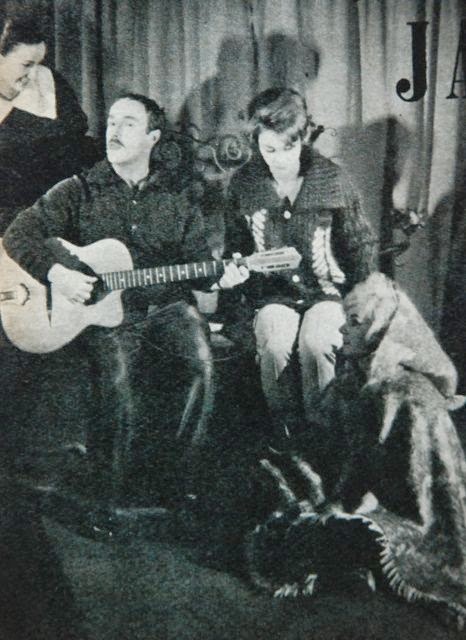 Jacques Esterel, dressed in old wide trousers and a sailor's sweater, "because it's so comfortable", sings to his clientele during his shows. He sings the songs he has composed in a lost hour. For those visitors who don't master the French language, he has a puppet theatre which transfers the cheerful, often risqué lyrics of his songs into images. He writes plays and, with a broad smile and a grand gesture, he doesn't hesitate to offer a countess a spot on the floor when there are no chairs left. "I don't like that official stuff" he says and that has made him the infant terrible of haute couture. 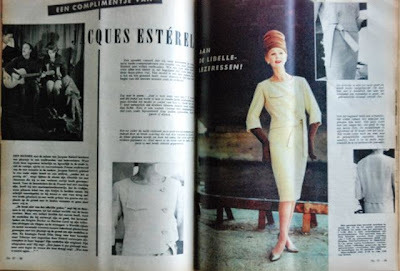 But a successful infant terrible because his designs are so good that celebrities like Brigitte Bardot and Martine Carol are attracted to his collections like flies to syrup. The most wealthy and spoilt some in the world will indeed smilingly satisfy themselves with a place on the floor to see his designs. 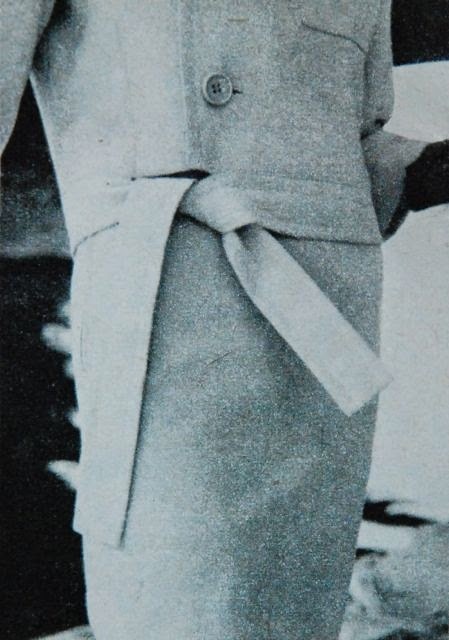 And queen Farah Diba (the then just married queen consort of Persia as the wife of Mohammad Reza Pahlavi) flew to Teheran for her wedding with no less than nineteen ski outfits designed by Esterel in her luggage! His designs are original. So is what he says! Like this: "A dress is only successful when people say to the lady who wears it: "You've got such beautiful eyes..."
Well, I don't know about you, but I'm all for designers who think a woman has to wear the dress, not the other way round! And then there's the design Libelle bought for its readers. 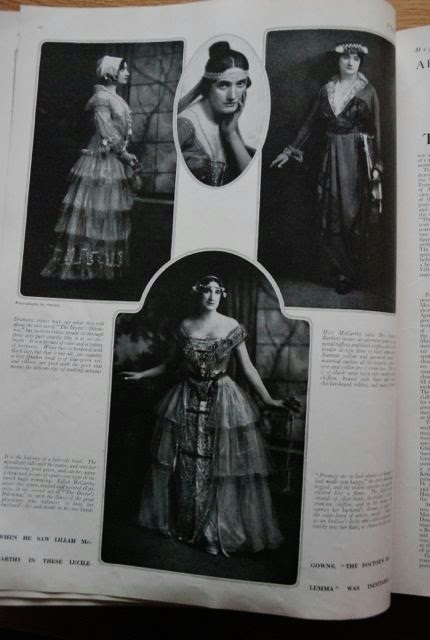 I don't know whether these pictures are of the dress which was in the original show or of a sample sewn up at Libelle's pattern office. Obviously, we won't deny our readers a creation by this Jacques Esterel in our series of haute couture patterns. Anyone with a sense for the new and happening will understand why we were attracted to this two piece outfit. The design is rather different to what you are used to, but that's why it's so welcome at the start of the new season! Don't say too soon: "That is not for me!" In this suit, you can obscure a short or not very slender waist and because the design flows, it flatters. Of course you know that dark colours will make you look more slender than light ones. Choose a fabric with a soft hand (but avoid those with a high nap), like fine wool gabardine or alpaca. The jacket, which reaches to below the waist, has an asymmetrical effect because of the wide overlap which closes with three buttons in the same colour and the pocket which is placed just before center front.The shape of the neckline is quite pretty. The jacket is decorated with wide lines of topstitching. The belt is attached to the jacket and is loosely knotted. 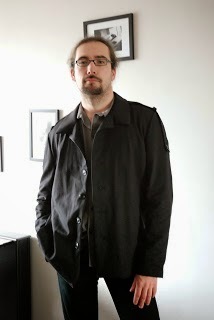 In this picture, you can spot the side panel attached to the front of the jacket. So, there is no normal side seam. There's a side panel at the back too, but it starts at the sleeve seam. The jacket is a bit longer at the back which gives it a flattering line. 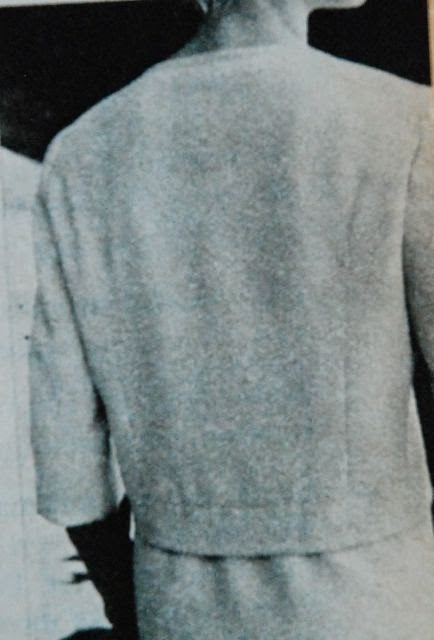 The sleeve length is in line with the length of the jacket. The slim, straight skirt is gathered, rather than darted at the waistline. And I don't think anyone has failed to notice the high number of jumpsuits in stores in the past years. They were mostly there in summer and they're back again. Usually, I don't really like the ones on offer in RTW. Too baggy, too boring, relying too much on stretch or some combination of the above. However, when I walked past Zara this weekend, I saw one I did like. The garment on the right in this picture is a jumpsuit. On the dummy, it looked like a kind of wrap style. With a collar. And three quarter length, lightly tapered legs. With pockets. And a fold in the trouser part which is obviously part of the opening and provides some interest. Ehm... Check, check and check. Does it come in other colours than white? It's been a very long time since I have even remotely considered buying something purely for the look and inspired by the window display. I didn't have time to enter the store and the thing on though. Today, I thought it would be fun to blog about it so I decided to try and find the item on the Zara website. I still loved it in the picture shown above, but then, I went to the product information (which also taught me it doesn't come in any other colours). Well... I don't love it anymore. These pictures actually show the construction details a lot better than the window display did. It's not actually a wrapped garment. That belt is a separate piece. 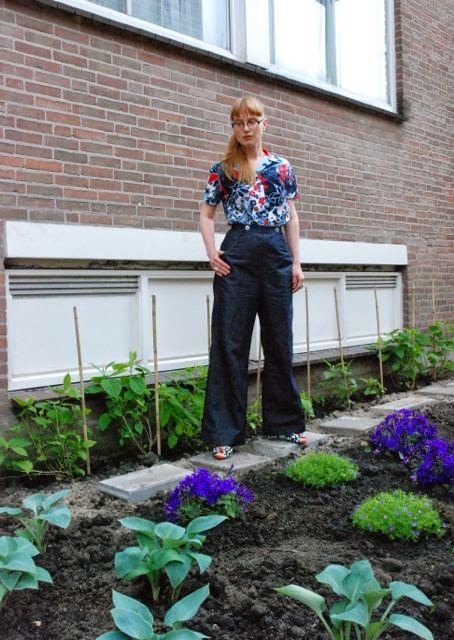 The jumpsuit itself is a wide thing, folded to close. It's not clear whether or not that fold is secured by anything else than the belt (if I made this, there would be hidden buttons but if there aren't the garment would be easier to wear for people with different body shapes). Still clever, still interesting but a bit too loose for my taste. 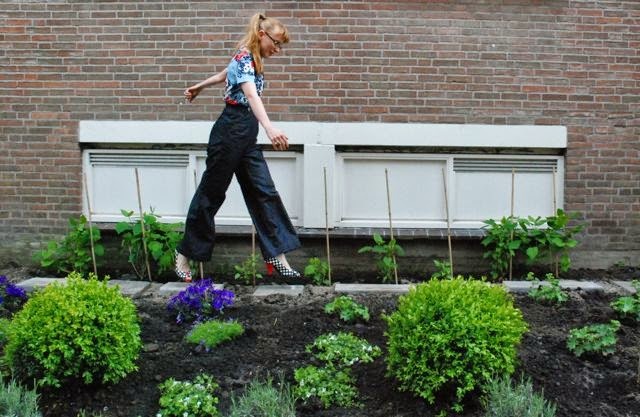 And I thought it had sort of calf length legs but this model is 175 cm (it says so in the information), which is substantially taller than I am and it's ankle length on her. I may still go and try it on, if I can find a good time and opportunity. It would be nice to study the details of the pattern and construction. The second book is no longer in print but used ones are easily available. The title suggested it's what I want and there was a rather informative review about it as well, so I decided to try it. So far, I've looked through both books and each seems promising in its own way. I was thinking it might be a good idea to sit down and read them properly before starting on anything, but I couldn't control myself. 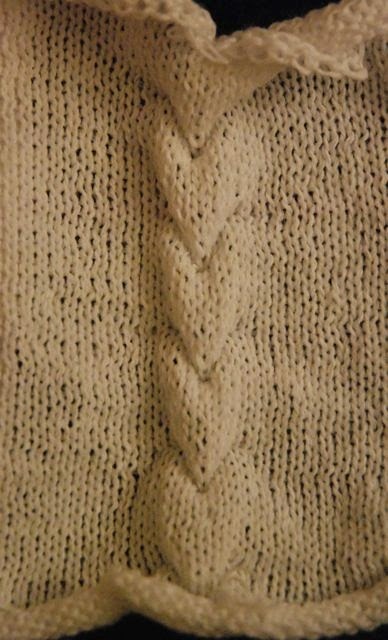 You see, ever since I first tried knitting (hand knitting, a few years ago), I've wanted to make something with cables. As I've explained before, hand knitting wasn't my kind of thing. When I bought the knitting machine and studied its manual, I was inclined to believe that knitting cables required some kind of implement not included in this particular set. 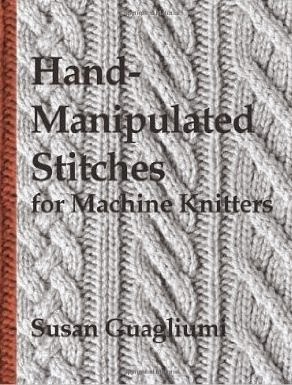 Until I found a book about knitting machine stitches in the library. 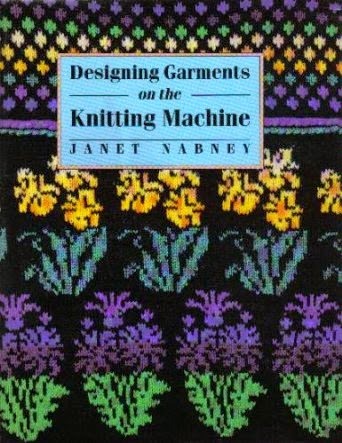 In it, there was the suggestion that you could knit cables on a knitting machine by manipulating the stitches by hand using the two and three eye tools. I tried using that book and got some result, but the instructions were rather sketchy so the real method still wasn't clear to me. 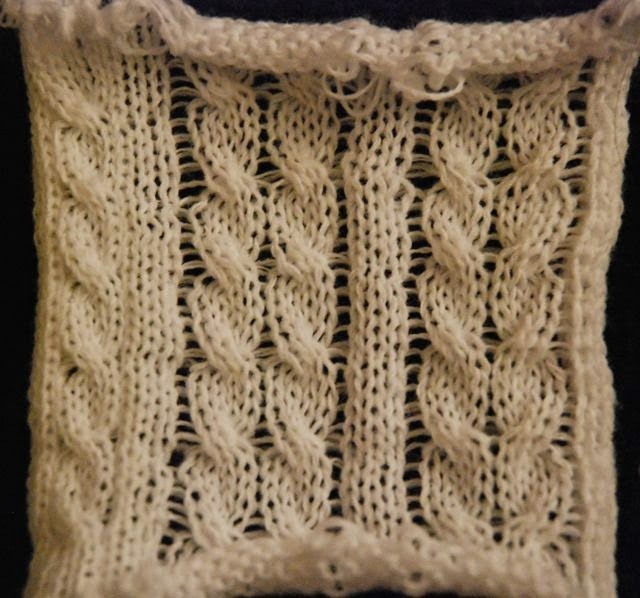 Now, using my new book (in which cables are chapter four or five), I've started to make swatches systematically. These are not cables. They are what the book calls 'rehung stitches'. 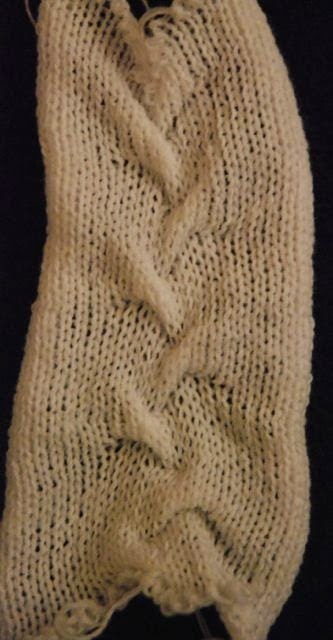 Basically you knit for a number of rows, then pick up certain stitches several rows down and put them back on the needles. Either on the needle they came from or on one to the side of it. You can get pretty cool effects that way but unfortunately, it pulls in your knit work lengthwise and compromises its vertical stretch. So, it's not an effect which will work well in any kind of project. Rope cables: single, parallel and opposing. And serpentine cables: single, parallel and opposing. On my single bed machine, I have to leave the stitches right next to the cables un-knitted. I can purl them by hand later. On the swatches, I didn't feel like doing that everywhere, so you can only see the actual effect of a cable in the fabric on the single rope cable and the opposing serpentine one. 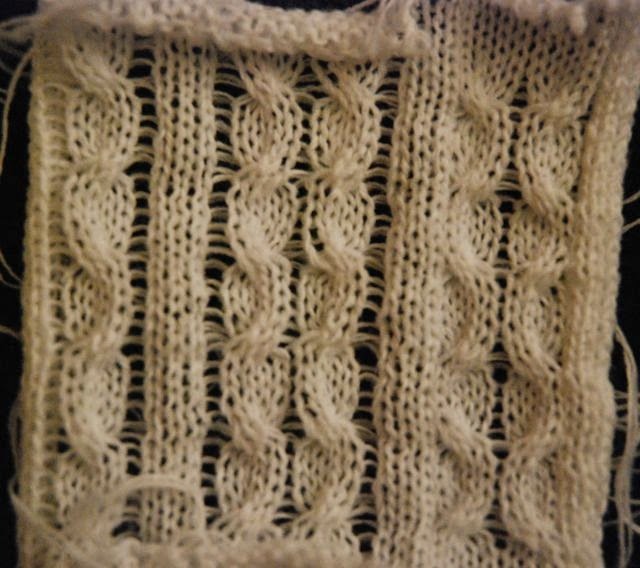 I want to try some less standard kinds of cables next and then try and design a very simple sweater or cardigan using several varieties of them... Wish me luck! My dress with the unusual tiered skirt. 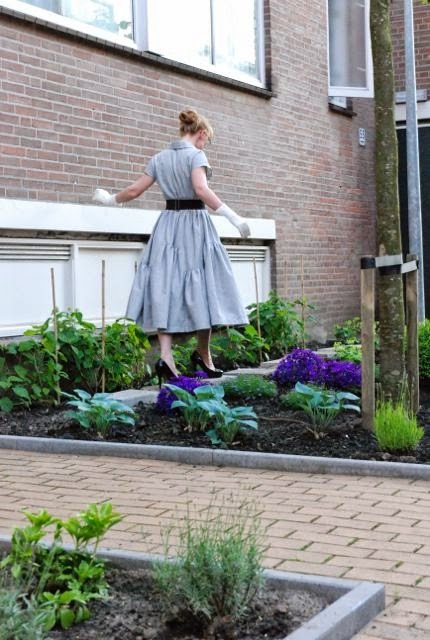 You can read all about making a skirt like this in this post but this is my version. 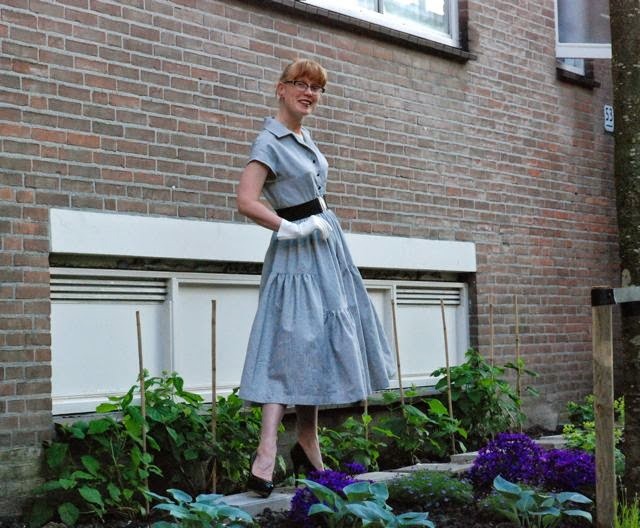 Based on a picture of a dress for which Libelle magazine was selling the pattern in 1956, but drafted entirely by me. 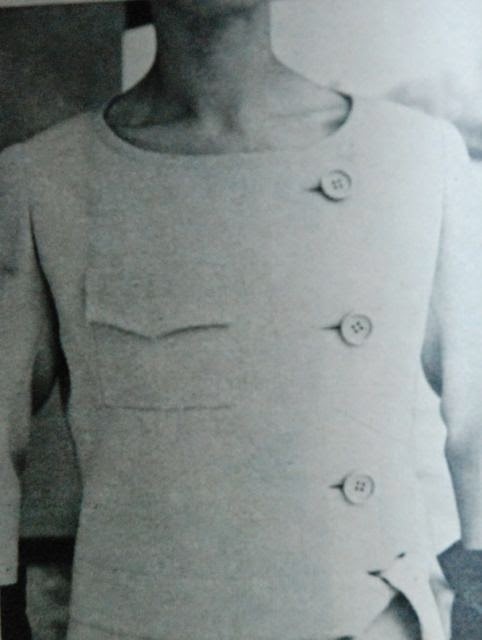 In fact, the bodice is the same as the one I used for the 'pleats and pockets' dress, buttons at center front, fitted with darts , short cut-on sleeves (this length is sort of between cap sleeves and kimono sleeves, so I'm not sure what to call them). I just added a collar this time. Then, that big skirt with all its tiers and gores was just gathered to the waistline. The fabric came from my stash. I used some of it last summer to make a pair of trousers but I wasn't happy with those, so I cut them up to make trousers for baby J (my nephew) earlier this year. This dress used up all of the remaining yardage. I would have preferred a bold stripe for this design but I really should be sewing from stash, so that's what I did. The first time I tried the dress on, I was a bit disappointed. It just seemed a bit lackluster somehow. By now, I think I know why. 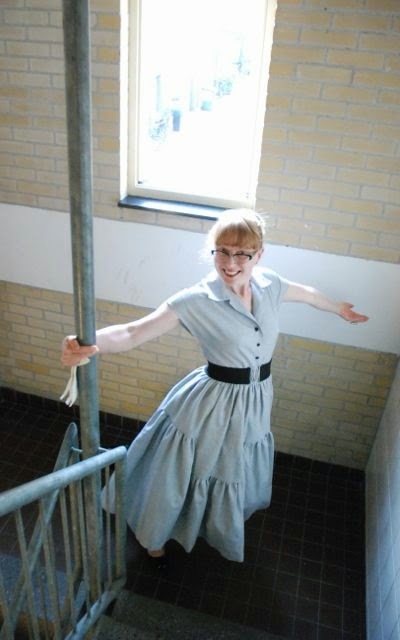 I tried it on without a petticoat. 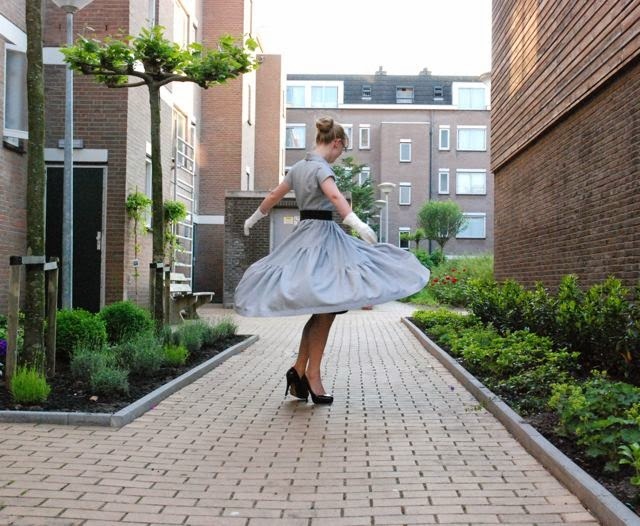 I usually wear my vintage style dresses without petticoats but most of them have circle (or narrower but still flared) skirts, which are shaped to flare out at the hem. This skirt has plenty of fullness at the hemline but lacks that incentive (from the cut) to flare out. 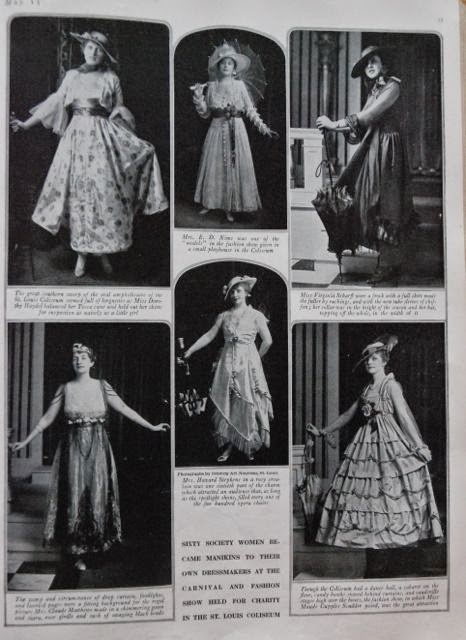 With a fluffy petticoat, like in these pictures, it comes into its own. 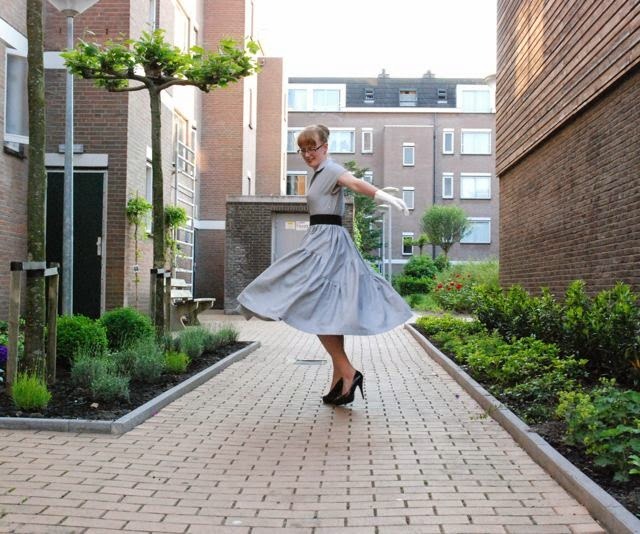 Oh, and eh... of course, it's great for twirling! 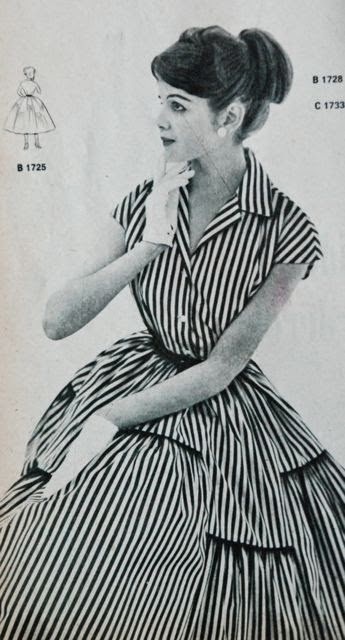 This image is from an issue of Libelle magazine from the summer of 1960. Now, as you know, I enjoy collecting and reading vintage magazines. 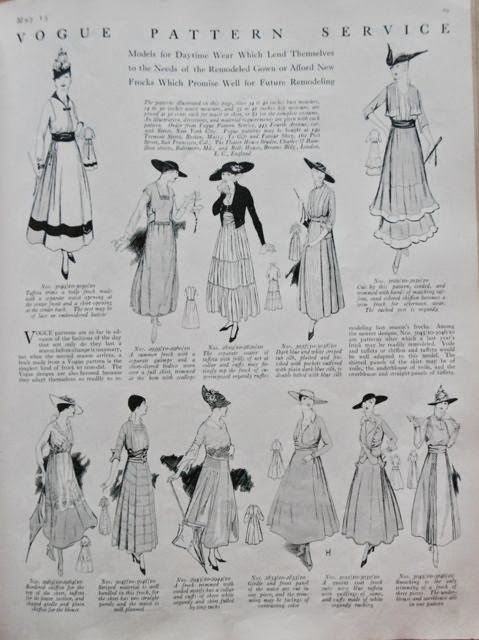 I like vintage fashion and vintage sewing patterns. Not just the dresses but separates, suits, trousers and playsuits too. 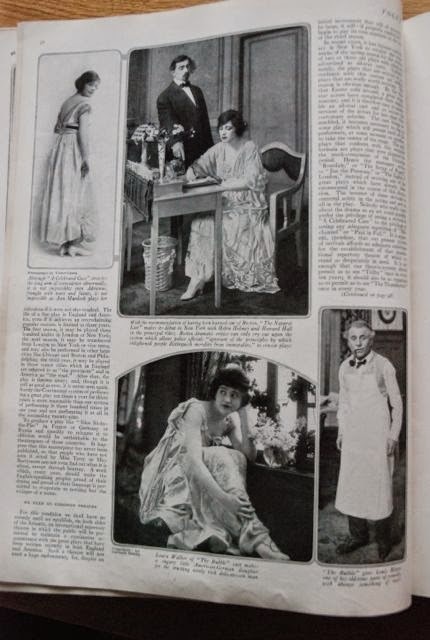 And usually, when I get period photographs instead of the usual drawings, I consider that to be a treat. Ehm... What can I say. 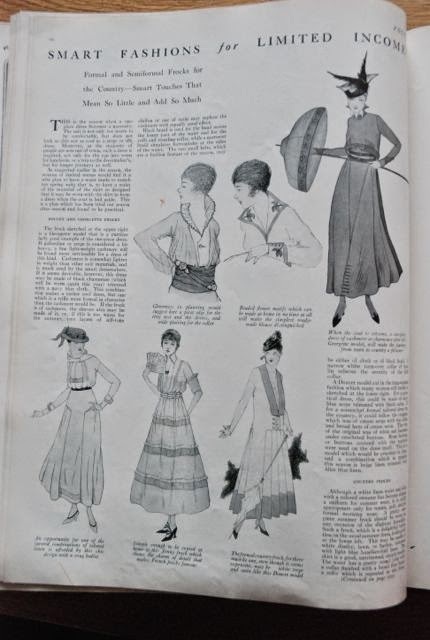 According to the text, this is a combination of a top and trousers with tapered legs for which you could order the pattern. 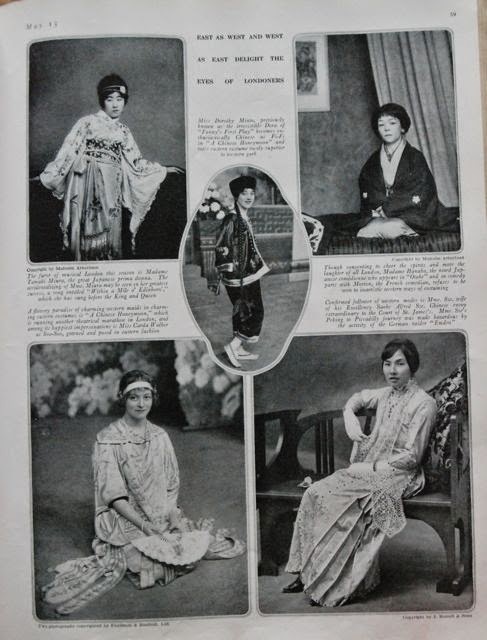 The photograph was shown on the back cover of the magazine which is why it is a full page and in colour. I think it looks crazy. And not in a good way. That is way too much gingham for my taste, I'm not a fan of the shape of the outfit or the ruffle down the front and the combination of make-up and the way she is posing makes this lady look a bit... eh... insane. However, this was a serious picture promoting the magazine's patterns back in the day. Which makes me wonder: Does your love for vintage style stretch this far? Two years ago, I made this spring/summer jacket for E. Since then, he has worn it about every day when the weather was right for this kind of garment. The buttons holding the long epaulettes came off a couple of times, it faded a bit in the laundry but otherwise, it performed admirably. Until last week, when he got a big tear on one of the sleeves. 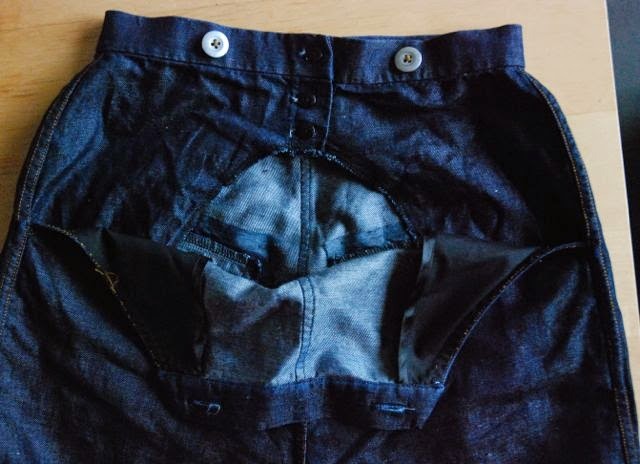 Serious damage to the fabric which compromises the integrity of garment is kind of a damning thing, in my opinion. It's time I made him a new jacket. It will be in cotton again but I'll be using the thinner and sturdier stuff which I've used for trousers as well, rather than this twill. It will be black(ish) again. 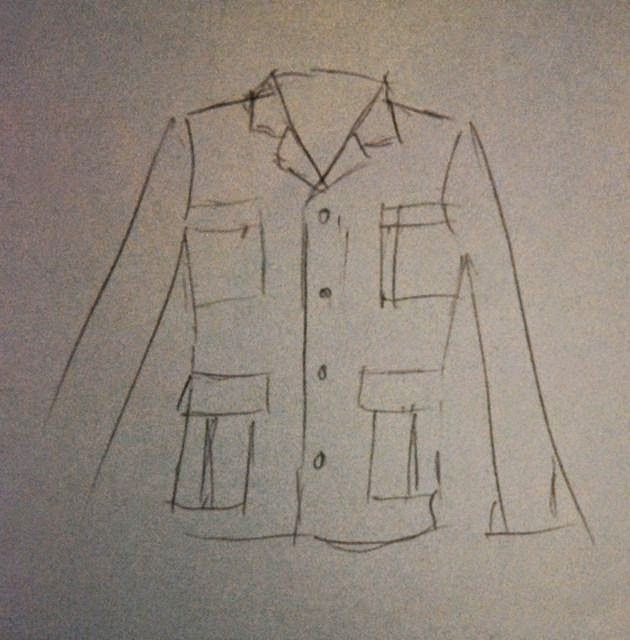 And, knowing how and when he'll wear this jacket, I think I will base the design, again, on the casual jacket block, rather than the more confining (especially at the shoulders and upper arms) formal blazer block. I used that same block for this winter coat for him, which I made to be sort of semi-fitted. I've tried a blazer block in the past but I have never been completely satisfied with its fit and I've noticed E prefers the more casual shape for every day wear. So those are my practical considerations. Now, it's just a question of style. How do I want my man to look? Keeping his usual dress sense in mind, of course. 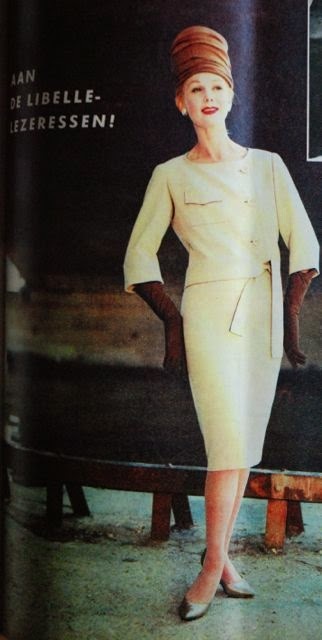 As you know, I love looking at vintage fashion images for inspiration. 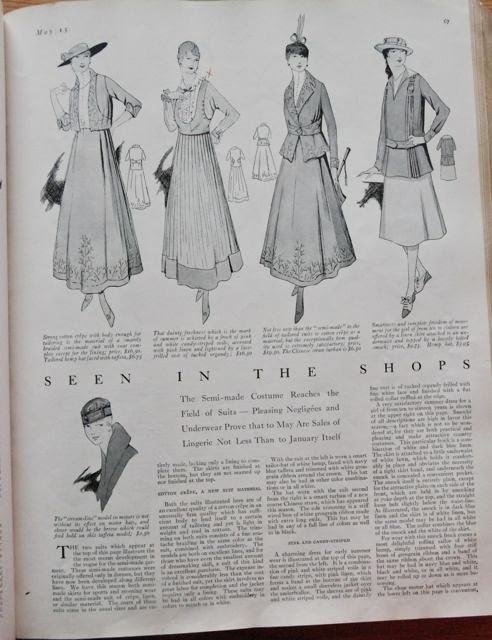 And thinking about a jacket for E, I remembered something I thought I had seen in 1930's magazines. 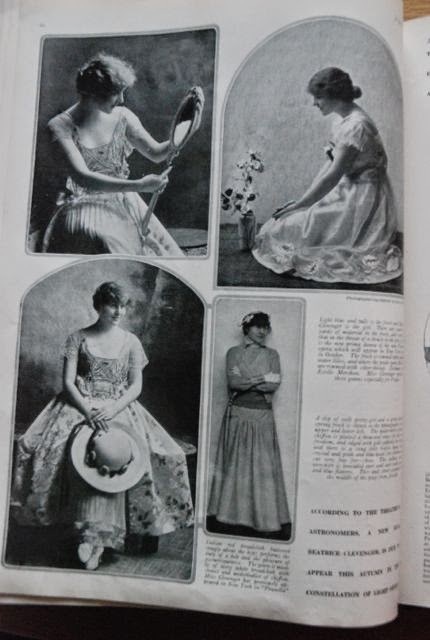 The following images all come from the book "Every day fashions of the thirties, as pictured in Sears Catalogs". 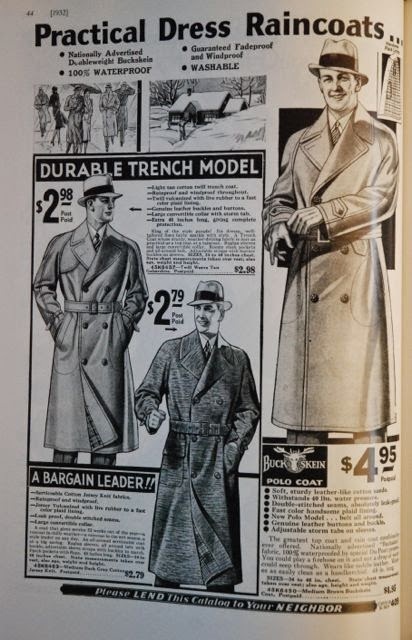 I like the trench coats. I was kind of considering a look like that. I'm not sure about it though. Ironically, considering the background of the garment (the original versions were worn by British army officers in the Great War), I think E might not see it as a contemporary garment for a young(ish) man. After all, we've seen random trench coat interpretations for women all our lives. For men, we only see the occasional, very traditional version. Often in beige and worn by an older gentleman. I still think it's a true classic that may be in for another revival soon, but is this something E would wear? 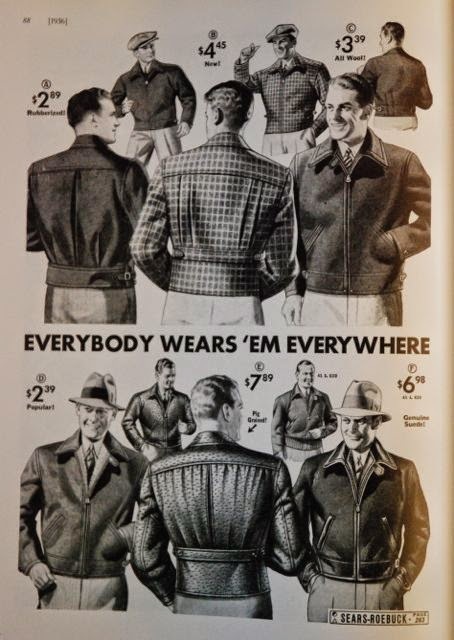 Then, there are the sporty jackets of the 1930's. They're fun, and the back treatment with the pleat is what I was looking for. However, the overall look is clearly not for E. Wearing one of these requires an entire vintage style wardrobe. 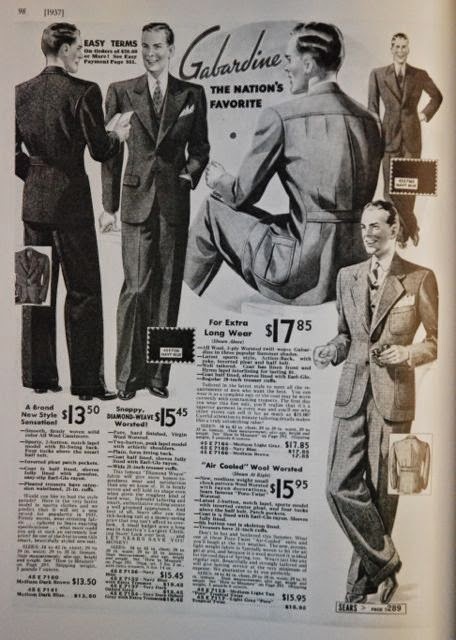 These jackets on the right come closest to what I thought I remembered: A fitted blazer with an 'action back', a back pleat to provide ease of movement. I'm sure I've seen more of these on coats and jackets for sports and hunting. This is the most common version, with a center back pleat and a waist seam. Two single pleats further towards the sides is also possible and in classic British hunting attire, you will also see carefully tailored tweed jackets with a pleat in the armscye. The jackets in this image don't quite have the outdoorsy vintage sportswear look I remembered though. From the front, they look like any other jacket. And, as I mentioned, I know I shouldn't use a fitted blazer block with high sleeve heads. To be honest, I don't like making cargo pockets or any other style of patch pocket with flap. It's just a lot of work for something so simple. However, for E and for the kind of jacket I'm imagining, it just seems right. It will be another week or so until I will have the time to start drafting anything like this, so I'll have plenty of time to consider my options. What do you think: Use vintage inspiration, or don't? 1930's or some other era? 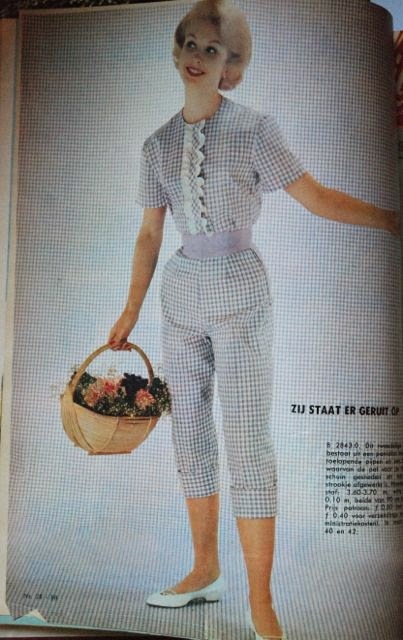 As I've mentioned before, this image is from a Libelle magazine from the summer of 1956. It was a pattern which readers could order, but obviously, it's not available anymore. So, I drafted my own. Instead of the wonderful, ideal-for-this-design bold black and white stripe in the picture, I'm using a fabric with a thin black and white stripe. Because it was in my stash. The dress isn't finished yet, but I thought I could share some information about that skirt with you. It's not difficult to make but it is eye-catching and unusual. It will should look great in my finished dress but it could also complete a different kind of bodice and I think it would work equally well as a skirt on its own. For this skirt to like the one in the picture, it would have to be full. Mine is just under 4 meters wide at the hem. The width of the first tier is almost 2 meters. To get the interesting effect, the skirt has two tiers and eight gores. On four gores, the top and bottom tier are of the same length, on the other four, the bottom tier is substantially longer. To get the look from the picture, the middle of one of the short upper tiers is placed at center front. This means that center back and both sides are in the middle of a gore as well, so you'll either have to put the closure in an unusual place or insert an extra seam or a facing to make one (I'll make use a facing lined up with the bodice side seam to include a zipper). The middle length rectangles are 42 cm long, four of them are 50 cm wide, the other four 25 cm. Then, there are four pieces of 57 cm long and 50 cm wide and four of 27 cm in length and 25 cm in width. Which left me with enough fabric to cut out the bodice pieces. The layout in the picture is for fabric folded in half as usual when cutting, the sizes given in the text are the sizes of the whole pieces. If you add up the numbers, you will notice that this will give me a skirt of about 80 cm in length, providing I use a separate hem facing of some sort. I like my vintage style skirts to have that kind of fairly authentic length. If you don't, or if you are substantially shorter than I am, you may want to adjust the length of the pieces. After you cut the pieces out, stitch gathering threads to the tops of the wide bottom tier pieces. Gather them to fit the top tier pieces and stitch in place. Middle length ones together and long pieces to the short ones. Finish the seam allowances (I just serged mine) and press flat. Then, pin and sew the gores together, alternating the two kinds. After that, gather your top tiers in one go (and insert a zipper in the method of you choice, of course) and attach to the bodice or a waistband. Before you ask, the size of this skirt can very easily be adjusted. Basically, to get a full-ish skirt, you want each gathered piece to be at least twice as wide as the piece it is gathered to. 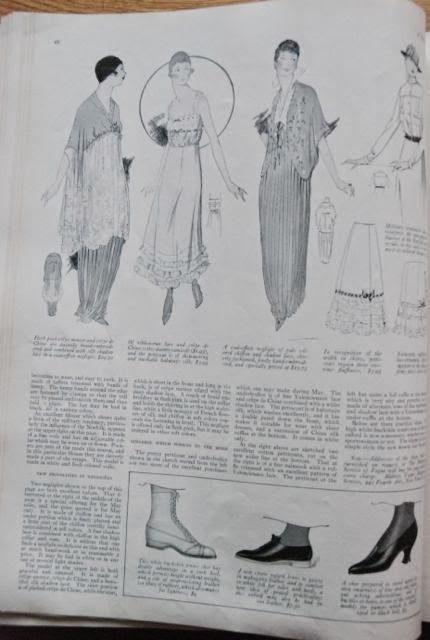 This means that you could use my pattern pieces for sizes up to a 100 cm waist... Although wider is nice too. I went with a bottom tier twice as wide as the top tier and the top tier being a bit over three times the width of the bodice waistline. I hope my explanation makes sense. As ever, don't hesitate to ask if you have any questions and if you make a garment using these instructions, I'd love to see it. 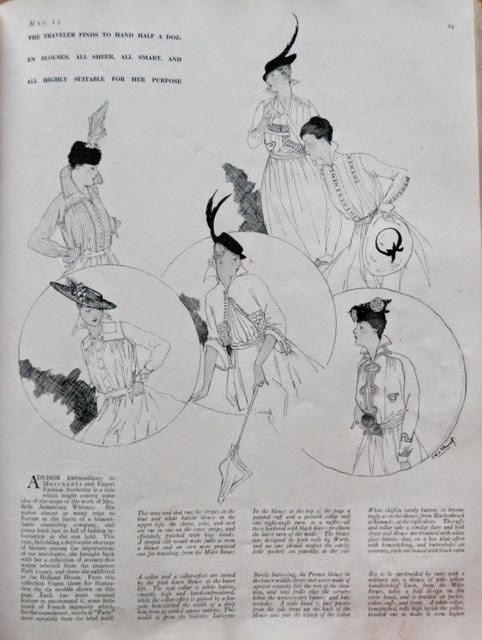 Quite a few of you liked the images from the American Vogue magazine from 15 May 1915, so I thought I'd show you the rest of the fashion-related pictures from it. Here, we see society ladies play model for their designers for a charity event. 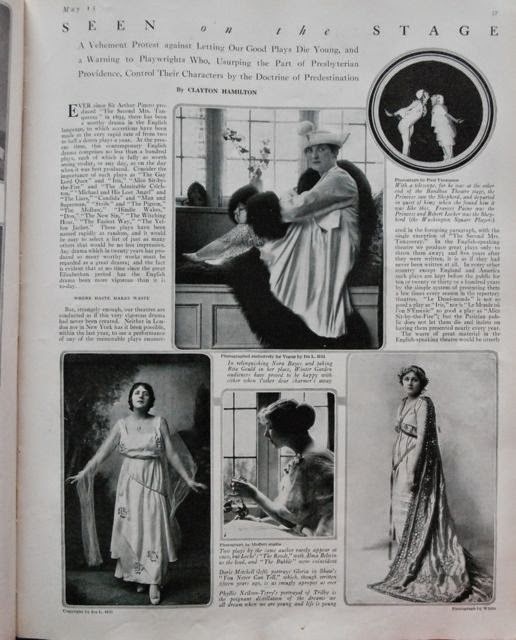 These pictures have to do with the 'Vogue fashion fete' which, by the looks of it, was about fashion history as well. And these lovely ladies were actresses. Oh, and it's still the May issue and we're thinking about traveling. Blouses are a useful addition to anyone's travel wardrobe. Every girl needs shoes, doesn't she? These lovely ladies illustrate the cross-over between Asian and western fashion. Very elegant. and posing in normal fashion. 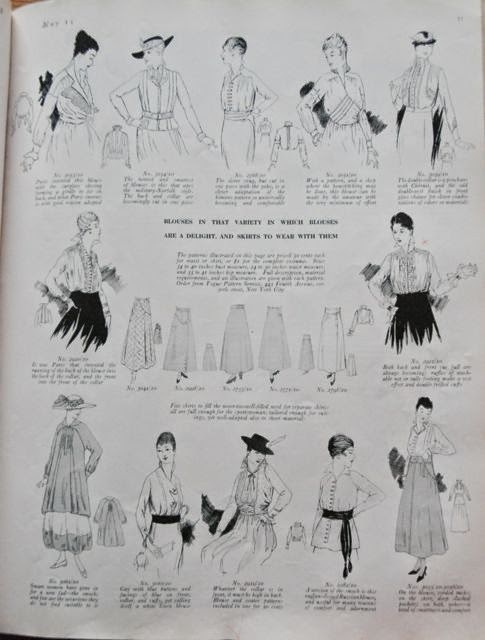 And something near and dear to our hearts: Vogue's pattern service. 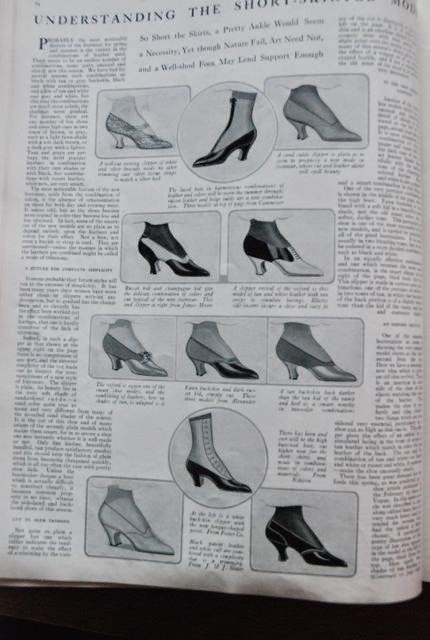 Such lovely designs... How cool would it be if we could still back-order them today?